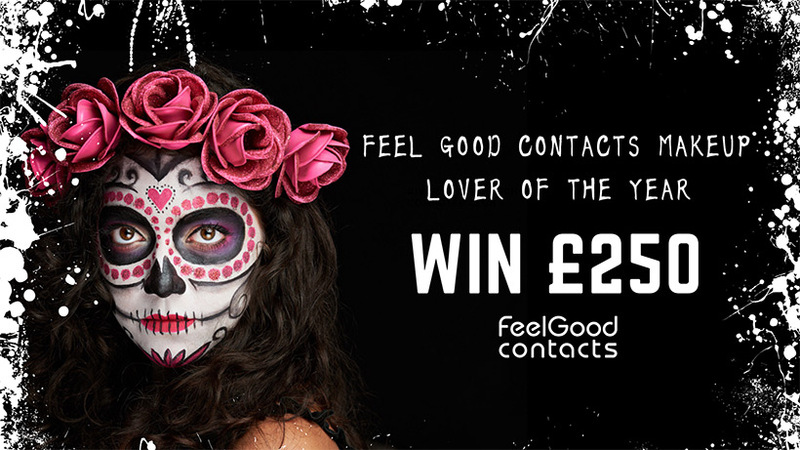 Feel Good Contacts is launching the Feel Good Contacts 'Makeup Lover Of The Year Prize' and challenging professional artists and makeup enthusiasts alike, to create Halloween looks on social media to be in with the chance of winning £250. This amazing competition is international and open from September 13th – October 31st, 2018. Create an Instagram video of you creating your Halloween look and post it on your main Instagram feed. Add the hashtag #FeelGoodMakeupLovers and tag us @feelgoodcontacts in the caption. Create a Halloween Youtube video tutorial and include the words ‘Feel Good Makeup Lover Halloween Entry’ in the title. You may enter up to 3 separate looks. Once you have created and posted your look, please e-mail the links of each of your entries to marketing@feelgoodcontacts.com with the subject line 'Feel Good Makeup Lover Entry'. This is simply to ensure that we see your entry as it may get lost in the sea of pictures and videos on social media. You must complete this final part of the entry process for your entry to be valid. 1 winner will receive a £250 cash prize. 9 runners up will receive a pair of colour contact lenses. The cash prize is open internationally. The Feel Good Contacts Makeup Lover Of The Year Contest is open Internationally. Entrants must be over the age of 16 to enter and anyone under the age of 18 must have permission from a parent or legal guardian. Feel Good Contacts employees and contractors (and their families), their associated companies, agents and anyone directly connected with the organization, and operators of its brands and concessions are not able to enter. Brand ambassadors/bloggers who have worked with Feel Good Contacts Ltd within 30 days of the competition launch are prohibited from entering. There is no payment or purchase necessary to enter this competition. No communication will take place with competition entrees other than in connection with this contest unless they have opted-in to receive such marketing communications or signed up to our website. Entrants can put forward a maximum of 3 separate entries. No third party or automated entries are accepted. No responsibility is accepted for any entries that are incomplete, lost or delayed or are unable to be submitted because of any technical difficulties or any other reason. The start date of the competition is 6:00am GMT Thursday 13th September 2018, closing date is 11:59pm GMT Wednesday 31st October 2018. 10 entrants will be shortlisted on Tuesday 6th November 2018 by the Feel Good Contacts Team. The winner will be announced via our social media platforms and on the official Feel Good Contacts blog by Friday 9th November. Winners will be contacted via the e-mail they sent their entry through and must respond within 5 days of receipt or forfeit their prize. By entering their details, entrants will be deemed to have accepted and agreed to be bound by these conditions. The decision by the judges is final. Neither correspondence nor discussion concerning any decision shall be instigated by any entrants. We are not responsible for additional taxes or bank charges which may include currency conversions or any other charges that may be incurred when receiving the cash prize. These are the responsibility of the awarded winner. Should the winner reside in a country where the primary currency is Euros, the winner will be paid to the sum of €250. The winning entrant must have a valid bank account to receive payment of the prize. The cash prize will be awarded via bank transfer only. Winners give Feel Good Contacts Ltd the right to re-post and use their image on any editorial or promotional materials.